After weeks of sluggish progress phase two of the D-Day invasion opened up a rapid advance toward Germany. In the 1970 film Patton, General Omar Bradley, played by Karl Malden, tells General George S. Patton, played by George C. Scott, that he has a plan called “Cobra.” If Cobra works, Bradley goes on to say, it will allow the American troops to break through the Normandy beachhead perimeter and advance into the open plains of France. Whether or not Bradley ever really said this to Patton is not known, but he was certainly thinking it. But in fighting their way south, the Americans found themselves fighting two enemies. The first was the Wehrmacht. The second obstacle, which would prove to be as persistent and as deadly as the German Army, was the land itself. The bocage consisted of a series of hedges and ditches that crisscrossed fields for miles on end, favoring the defending German troops and making any advance by Allied troops very slow and extremely costly. General Walter Bedell Smith, Eisenhower’s chief of staff, described the bocage as a hellish place “where every small field was a fortress, every hedgerow a German strongpoint.” In 17 days, American forces lost about 40,000 men in the hedgerows. Eisenhower and his generals were becoming desperate to find a way out of them. German troops used the hedges for natural camouflage. The bocage gave machine gunners and infantry perfect positions for firing on unsuspecting troops. The 90th Infantry Division suffered replacements of 150 percent of its officers and more than 100 percent of its enlisted men in six weeks. Tanks did not fare any better. In his book Overlord, Max Hastings states that the 746th Tank Battalion lost 44 of 51 Shermans in 23 days. By July 20, the U.S. VII Corps had fought its way to St. Lô. By that time, there was nothing left of the town except bomb craters and the rubble of destroyed buildings. But in taking St. Lô, American forces had cracked General Eugen Meindl’s elite II Parachute Corps, a psychological as well as military victory. The GIs had proved to themselves that they could hold their own against even the best troops the enemy could send against them. Because radio signals from panzer units in Normandy had been picked up by Ultra intelligence cryptanalysts in England, General Eisenhower knew that Hitler was planning a counterattack against the British and Canadian positions at Caen. With this in mind, Eisenhower asked his ground forces commander, British Field Marshal Bernard Montgomery, to draw up plans for an attack against the Germans from Caen, which was on the eastern end of the Normandy front. In other words, Eisenhower wanted Montgomery to launch an attack before the Germans could begin their counteroffensive. Montgomery’s plan called for a joint attack by British and American units from each end of the Normandy beachhead. The British offensive against German units outside Caen was given the code name Goodwood. After this phase was under way, the Americans would launch Cobra, an attack on panzer and infantry units at St. Lô. If the two-pronged offensive succeeded, it would trap the German Seventh Army between the British and American pincers. At 5:30 am on July 18, more than a thousand Royal Air Force bombers released their loads over the German positions at Caen. When the RAF had finished, 571 heavy bombers of the U.S. Eighth Air Force dropped still more bombs on Caen. This was followed by an artillery barrage and air strikes by about 800 fighter bombers. When the bombardment ended, about a quarter-million men and 1,500 tanks began moving out of their positions and advanced toward the German lines. The tanks were slowed by the thousands of bomb craters, which allowed the SS panzer units time to recover. British armored units advanced about three miles before encountering withering German antitank fire. “Withering” is an appropriate word to describe what happened to the British offensive. Some units lost 50 percent of their tanks, and the offensive began to lose momentum. 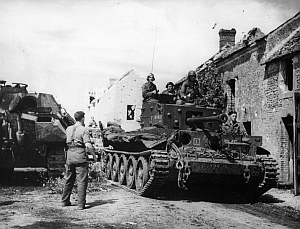 By July 21, British and Canadian troops had taken most of Caen but had lost up to 400 tanks and suffered more than 5,000 casualties. Most important, the breakout from the Normandy beachhead had been stopped by the SS divisions. The Germans were still in position on the other side of the River Orne. Because Goodwood had failed to achieve its objective, Montgomery came under harsh criticism from both British and American commanders. Air Chief Marshal Sir Arthur Tedder was one of Montgomery’s most vocal critics, along with General Frederick Morgan, one of Operation Overlord’s original planners. But Eisenhower told Monty to stand by to begin another offensive from Caen. The Germans had lost as many men and tanks as the Allies and could not replace them. German commanders realized that another breakout attempt would be coming but did not know when or where to expect it. Field Marshal Guenther von Kluge, who had replaced Gerd von Rundstedt as commander of all German forces in the west when the latter suggested that the Germans should negotiate an armistice or face disaster, had a much higher opinion of British and Canadian troops than of American units and thought that the next attack would probably come from the Caen sector as well. 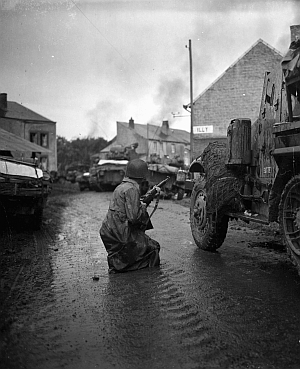 The American offensive at St. Lô, Operation Cobra, was to have begun on July 20, but had to be postponed twice because of heavy rain, clouds, and poor visibility. The attack finally opened on July 25 with a devastating artillery barrage and air bombardment. The opening aerial assault included saturation bombing by hundreds of Allied aircraft. The German units in the areas of the heaviest bombing were stunned, either devastated by the intensity of the aerial assault or rendered inoperable by the tremendous concussions of the bombs. One unfortunate casualty of the bombing was Lt. Gen. Leslie McNair, commander of U.S. Army ground forces, who was killed when his position was bombed accidentally. Armored and motorized units of the U.S. First Army moved out of their positions after the barrage and air attack lifted, only to discover that some tanks of the Panzer Lehr Division were shooting back at them. “It was hard to believe that any living thing could be left alive out in front of our positions,” said Lt. Col. George Tuttle of the 30th Division. “On moving on to enemy- held territory, our men ran into some determined resistance.” All along the front, the Americans frequently found themselves held up by tanks, supporting infantry, and the almost inevitable 88mm field guns. Colonel Hammond Birks of the 120th Infantry reported, “The going was very slow … the boche had tanks dug in, hull down, and were shooting perhaps more artillery than they had ever previously used along the American sector.” Not only had there not been a breakout, but some senior American officers began to worry that Cobra might become another Operation Goodwood—a costly stalemate at best. But General Bradley was not terribly worried. He told Eisenhower that it was always slow going in the early phases of such an attack, but that progress would become more encouraging in the coming days. Eisenhower was satisfied with Bradley’s explanation, which turned out to be more than correct. The American attack had one great unforeseen advantage. Field Marshal von Kluge still believed that the main attack would be coming in the Caen sector. This line of thought was reinforced by a Canadian attack near Caen on July 25. Although it was stopped by the 9th SS Panzer Division, the attack gave von Kluge the illusion that he was facing a two-pronged offensive. British and Canadian forces faced a total of 14 divisions, six of which were armored. The American attack had to contend with 11 divisions, and only two of these were armored. Many of the German divisions, including Panzer Lehr, had been weakened by fighting and by the Allied bombing. Von Kluge’s notion that the Canadian attack was a major assault prevented him from reinforcing the St. Lô sector with troops from Caen. American commanders did not know about von Kluge’s misapprehension, but they were aware that German resistance did not form one continuous line. The panzer and infantry units were giving the Americans a fight that they had not expected, but these “hot spots,” as one officer called them, seemed to be isolated. Individual pockets of resistance could be outflanked and bypassed, no matter how hard the Germans fought. Major General J. Lawton Collins, commander of VII Corps, sized up the situation and ordered his mobile columns to go around the enemy positions. On the morning of July 26, American units started breaking away from engagements with German tanks and moving into open country. Operation Cobra took on an entirely different complexion. This summed up the situation all along the front, which had suddenly become highly mobile. At 3 am on July 27, the first Cobra objective was reached. By noon, the 9th Infantry Division had broken free of German resistance and was moving south at a steady pace. The offensive was now beginning to encounter a new problem: American supply columns were having trouble keeping up with the advancing troops. As they tried to make their way south, the supply vehicles were running into the retreating Germans. By the evening of the 28th, “Packs of American tanks and motorized columns swarmed toward the south on all roads between the Vire and the Atlantic coast,” said German writer Paul Carell. “There was no cohesive German line left ahead of them.” German morale was crumbling as quickly as their lines of defense. “We were marching, marching back all the time,” a German soldier recalled. “The roads were crowded with American vehicles, and all that we could do was to take to the fields on foot.” He compared this to the retreat in Russia and considered this even worse. In Russia, at least they retreated with their units still intact. In Normandy, there were no intact units, only individuals and small groups trying to escape the rampaging Americans. At this stage, the American columns were strung out for many miles and heading south for all they were worth. On July 30, the 2nd Armored Division was attacked by German reinforcements. Outside the town of Percy, about 15 miles southwest of St. Lô, German mortar shells began exploding all around an American column, killing and wounding infantrymen and knocking out two Shermans. Two 75mm rounds were fired into the local church steeple, which was being used as an observation post. This put a stop to the mortar fire, but it took a full two days of fighting before the Germans withdrew. Once again, the Americans were elated while the Germans resigned themselves to the fact that their attack had failed. “Without proper artillery and armored support, the panzergrenadiers would not hold,” was the complaint of Heinz-Gunther Guderian of the 116th Panzer Division. “These were not the men of 1941-42.” With this German counterattack out of the way, American units kept pressing relentlessly southward. “All the American virtues of speed and energy had at last come to play on the battlefield,” wrote Hastings. On August 1, one of the most colorful and controversial American commanders of the war entered the fighting. General George S. Patton had been the leader of the fictitious First U.S. Army Group (FUSAG), a “shadow” army in southeast England intended to decoy the Germans into believing that a major landing would come in the Pas de Calais area. He hated the job of commanding a make-believe army and lobbied for a combat command. In July, although he had some misgivings, Eisenhower gave Patton the Third U.S. Army. Patton had a history of being difficult. He was nearly sent back to the United States in disgrace after slapping a private in Sicily in 1943. In spite of Patton’s past, Eisenhower decided to take a chance with him. 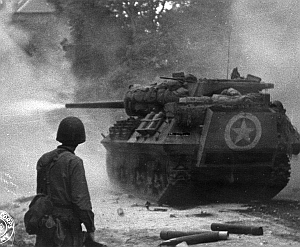 The U.S. Fourth Armored Division had captured the strategic town of Avranches on July 31, the day before Patton took command of Third Army. Patton used Avranches as the jumping-off point for his 400-mile run across France. It was another cause for celebration for the Americans, who took thousands of demoralized German prisoners. Even General Eisenhower was moved to call this a clear and decisive breakout. The tanks and motorized units of the U.S. First and Third Armies drove forward with a rush that astonished Allied commanders as much as the Germans. Operation Cobra was succeeding beyond supreme headquarters’ most optimistic predictions. Hitler decided to stop this headlong advance with a counterattack, which was code-named Operation Luettich. For this attack, he allowed von Kluge to take units away from Fifteenth Army, which was stationed in the Calais area. Von Kluge wanted to start moving against the Americans right away, before the Allied forces became any stronger and gained any more ground. During the night of August 6, elements of four panzer divisions, including what was left of Panzer Lehr, began advancing toward the Americans. To succeed against the steamrolling American offensive, von Kluge needed good luck and bad weather; he got neither. Operation Luettich was slowed by determined resistance outside the town of Mortain on Hill 317, about seven miles from Avranches. And the counteroffensive was stopped dead by rocket-firing RAF Typhoon aircraft, which roamed at will through the clear skies over Normandy. “With uncanny precision, the rocket-shells of the Typhoons smashed into their targets,” lamented one German writer. Forty-eight hours after starting their attack, the panzer units were forced to withdraw to their own lines. The 30th Division bore the brunt of the attack. Its commander, Maj. Gen. Leland Hobbs, said that the Germans were so close to his positions that his men could have driven the enemy off the hill if they had onion on their breath. The 2nd SS Panzer Division advanced to within a mile of Hobbs’s command post and looked as though it would overrun the 30th Division and push through to Avranches. Just after 3 pm on August 7, German tanks were within 200 yards of one of the regional command posts. Second Battalion’s aid station was captured on August 8. An SS officer under a white flag demanded that another American position surrender—a demand that was firmly refused. At a junction where five roads converged, an American private named Robert Vollmer knocked out two armored cars, a motorcycle, and a fuel truck with a bazooka. Another private, who somehow managed to find a bottle of whiskey and become “hopelessly drunk,” tried to man a bazooka and a machine gun at the same time. General Eisenhower wrote that if Operation Luettich had succeeded, the “results achieved would have undoubtedly been publicly characterized as a lost battle.” On the night of August 12, the 30th Division was relieved by elements of the 35th Division. The fresh troops were welcomed with enthusiasm, as well as relief. “What a sight they were, coming off the hill,” remarked a lieutenant attached to an antitank unit. Photographers and war correspondents came along with the relieving troops and lost no time in interviewing and photographing the defenders of Mortain. Twenty-four wrecked German vehicles were counted in the vicinity. With Operation Luettich running out of momentum at Mortain, the Canadian First Army attacked from the vicinity of Caen, pushing south toward Falaise. About 600 tanks struck von Kluge’s right flank and penetrated three miles into German territory. Generals Montgomery and Bradley, along with Eisenhower, could see that the German position was extremely vulnerable. With the Canadians continuing to move southward, Bradley’s and Patton’s forces had the chance to outflank the entire German Seventh Army, moving east and then circling northward toward Falaise to join with the Canadian First. If that happened, all the German forces in Normandy would be trapped. To prevent the Germans from escaping the trap that was closing on them, it was decided to implement a deception. The Germans were induced to believe that American units at Mortain and Avranches were being withdrawn to Brittany. Double agents reported to their German contacts that a major American offensive would be launched against the ports of Brest, Lorient, St. Malo, and St. Nazaire. It was also reported that Patton was sending units from Third Army against the Breton ports. According to the double agents, the front at Avranches was being decreased to strengthen the attack against Brittany. This was actually just the opposite of what the Americans were planning to do. The capture of the Breton ports had been assigned to Maj. Gen. Troy Middleton’s VIII Corps. General Bradley’s forces kept their position on Seventh Army’s left flank, while Patton’s Third Army kept moving eastward. 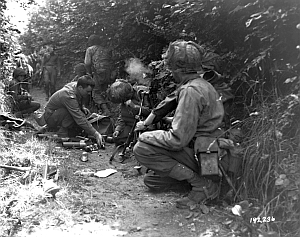 A unit specially trained in deception methods, given the misleading name of the U.S. 23rd Headquarters Special Troops, did move from Avranches to Brittany. This unit, consisting of 1,200 highly trained men, wore shoulder patches of units attached to both First and Third Armies and played recordings of tanks and trucks to sound like entire columns of armored and infantry divisions on the move. While Bradley, Patton, and the Canadian First were surrounding the German Seventh Army, the enemy was being given the impression that the Americans were moving west instead of east. 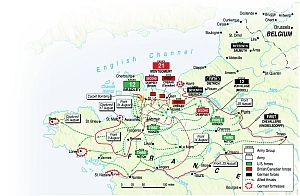 On August 11, Hitler must have taken a look at a situation map of Normandy for the first time. He finally saw for himself the predicament of Seventh Army. German forces were now surrounded on three sides. Their only escape route was a gap between Falaise and Argentan. Because he realized the situation by himself, without any prompting from his generals, Hitler decided to reverse one of his orders. He gave Seventh Army his permission to withdraw from the Mortain-Avranches area. 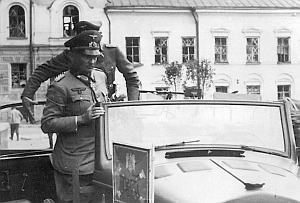 Hitler blamed von Kluge for the failure of Operation Luettich and also turned on Luftwaffe chief Reichs Marshal Hermann Göring. “The Luftwaffe’s doing nothing,” he shouted at Göring. “It’s no longer worthy to be an independent service. And that’s your fault. You’re lazy.” Hitler himself would not accept any of the responsibility for the failure. By the time Hitler allowed Seventh Army to withdraw, it was too late for some of the German formations. American armored units were within sight of Argentan by August 14. On the following day, the Canadian First Army launched another attack toward Falaise. This time, it was joined by the British Second Army. “The Germans were now confined to a pocket 40 miles long and 13 miles wide and shaped like a giant horseshoe,” with a 25-mile wide opening in the east,” said historian Martin Blumenson. The British and Canadian forces and the Americans narrowed this 25-mile gap with each passing day. While the Allied troops referred to the Falaise pocket as “the Killing Ground,” some German survivors called it “the Stalingrad of Normandy.” Along every road, the remains of tanks, vehicles, and men smoldered. Some bodies were so badly burned and mangled that they no longer appeared human. 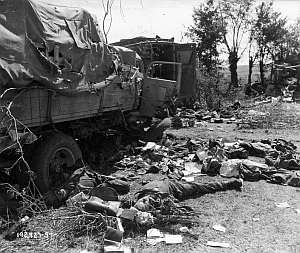 “Germans charred coal-black, looking like blackened tree trunks, lay beside smoking vehicles,” one Canadian soldier wrote after seeing the destruction in the Falaise pocket. The gap at Falaise closed too slowly to prevent the escape of several thousand Germans, most of whom lived to fight again in other battles. Estimates of the number of men who slipped through the Allied ring range from 2,000 to 50,000, with German figures tending to be higher than Allied estimates. Much of the blame for this escape has been placed on the Canadian First Army’s lack of aggressiveness and on General Montgomery’s preoccupation with being too “tidy” in the drive southward. Montgomery wanted the advance to be orderly, which prevented some forward units from moving faster. 10,000 Germans Were Killed and Another 50,000 Taken Prisoner. Even the official Canadian historian was moved to remark, “A German force far smaller than our own, taking advantage of strong ground and prepared positions, was able to slow our advance to the point where considerable German forces made their escape.” A general from the Canadian Second Division admitted, “When we bumped into battle-experienced German troops, we were no match for them.” Montgomery received another round of scathing criticism for not having taken control of the situation and for leaving the vital drive to the south in the hands of officers who were not up to the job. Others have criticized General Bradley for failure to close the gap in a timely manner as well. In concentrating on the failures that had taken place at Falaise, it is easy to overlook what was accomplished. An estimated 10,000 of the enemy were killed and another 50,000 taken prisoner. Among those killed or captured were four corps commanders and 12 division commanders. Also, 200 tanks were destroyed. These were losses that the Wehrmacht could never make good. Although thousands of Germans did escape the trap, they had to leave almost all of their equipment behind, another loss the Wehrmacht could not afford. When the Falaise gap closed, the German Seventh Army ceased to exist as a fighting unit and the Battle of Normandy was over. The Wehrmacht survivors of Falaise knew that they had lost. One group of stragglers from the 276th Infantry Division began walking eastward, having lost all contact with its unit. By following a tank for a distance, but mainly because of luck and determination, the group managed to walk right out of the pocket. At the village of Le Sap, about 25 miles due east of Falaise, they discovered that the entire population had gathered outdoors to welcome the coming Americans. The villagers had carried several tables out into the street and had filled them with all manner of food and wine for the imminent celebration. The Germans helped themselves to everything they could lay their hands on. What they did not eat on the spot they carried away with them. Then, they took the mayor and a parish priest hostage in case any members of the resistance happened to be nearby and marched the two frightened men ahead of them at gunpoint until they were well out of town. David A. Johnson, who contributed an article to the first issue of WWII History, writes from his home in New Jersey. Tags Caen, D-Day, Falaise, FUSAG, Hermann Göring, Lesley J. McNair, Operation Luettich, Striking Cobra.